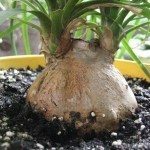 Should the large bulb base of the ponytail palm be below the soil surface? I have a large plant at the office and am now caring for it. I noticed the palm was planted below surface and thought it to be wrong; however, if plant is doing well, should I repot and get the (elephants foot) out of the dirt? The plant I am told is over thirty years and has survived several caretakers in spite of this error. Presently, I have removed the soil from around the base to slowly acclimate the plant to the future change IF I do repot it.